Ulaanbaatar: Zaisan Memorial, National History Museum, Gandan Hiid Monastery, Ancient capital of Mongolia- Kharkhorum, Nomadic family visit. Moscow: Irkutsk- Lake Baikal, Matryoshka factory with master class and museum of Cheburashka. Orthodox churches stand proudly alongside Soviet icons and chic modern boutiques in the nation's capital. 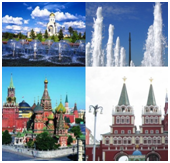 Be transported back in time at the Kremlin and wowed by the onion domes of St Basil's Cathedral. Sit back and relax as the lush forests of the taiga roll by on this once in a lifetime journey along the world's most famous train line. Days 6-8:	Lake Baikal/Irkutsk. Be a special guest of a local family during a traditional homestay on the shores of Lake Baikal. Later, enjoy time wandering through the streets of Irkutsk exploring the city's interesting mix of traditional Siberian and communist-era architecture and Russian cultures. From here, travel into legendary Genghis Khan territory. Note: daily train from Irkutsk to Ulan-Batar has no 1st class compartment, only 2nd class is available. Day 9:	Ulaanbaatar. Witness the old and new facets of Ulaanbaatar. Make time to see the Winter Palace of Bogd Khan, Mongolia's last emperor, as well as the beautifully restored Gandan Khiid Monastery. Mongolian Last King's Palace Museum , Zaisan Hill Memorial, Buddha's Statue. Overnight at hotel. Lunch in the ger camp. Opportunities to hike in the small sand dunes and riding a camel. In the afternoon we will visit Erdene Khambyn Khuree; the monastery is located in the majestic looking Khugnu Khaan Mountain. Enlightened Bogd Gegeen Zanabazar, a religious leader, philosopher, artist and sculptor was founded these Uvgun and Zaluu temples for his religious teacher. The soldiers of Oirad nobleman Galdan boshigt destroyed the monasteries and assassinated the monks in 1688. We will have an opportunities to visit horse breeder's family and experience making of airag, the Mongolian traditional drink made by mare's milk. Horse riding opportunities with Mongolian wooden saddles. After breakfast Continue tour to Khara Khorum the an ancient Capital of Great Mongolian Empire and main treasure of Mongolian Buddhism, an Erdenezuu Monastery. Kharkhorin was established in the valley of Orkhon River in 1220. It was one of the stopovers of legendary Silk Road for 140 years. Kharkhorin played significant role in Mongolian history; was a capital city of Mongolian Great Empire until Khubilai Khaan, a grandson of Chinggis Khaan moved the capital to Beijing of Yuan Dynasty. Back to Ulaanbaatar in the afternoon. Visit Natural History Museum. Shopping. At 18 Overnight at hotel. In the evening, enjoy a performance of Mongolian folk art.